After conceding twelve goals in their last two JFL matches, supporters of FC Ryukyu could have been forgiven for fearing the worst ahead of Sunday's game, even though their opponents were out-of-form Mitsubishi Mizushima. And sure enough, the former Chugoku Leaguers added a further three goals to Ryukyu's Goals Against column - but remarkably, scores from defender Teruo Hamada and new signing Tatsuya Kamohara in the last three minutes gave the struggling Okinawans a vital confidence-boosting 4-3 victory. The three points enabled them to leapfrog FC Kariya out of the bottom two, as Kariya's 5-2 thrashing at TDK SC was their fifth consecutive defeat. Also moving up the table are Sagawa Printing thanks to an impressive 3-0 win at Ryutsu Keizai University that included two goals for ex-Ehime FC striker Hirokazu Otsubo. 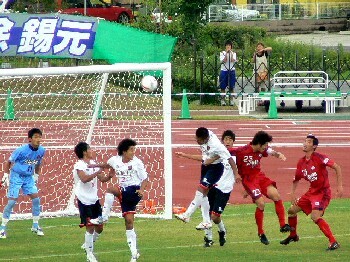 Bottom side Arte Takasaki almost inevitably sank to a 2-1 defeat at YKK AP, who now are in third place, in front of both Yokogawa Musashino and FC Gifu. Takasaki meanwhile have lost sixteen of their last seventeen games. But at the other end of the division, Sagawa Kyubin SC are four points clear of Rosso Kumamoto after winning 2-0 against Gainare Tottori.